In the class that I work in, we use and love Mystery Science. If you have not heard of it, check it out! It’s super engaging and the kids love it so much more than learning from a textbook. I believe you can still get one free year of membership. Each lesson (mystery) is set up with an “exploration” – usually a combination of video, pictures, and discussion questions. Followed by that is an activity – a fun, hands-on small project that the kids complete individually or in groups. Some activities require supplies that need to be purchased ahead of time, but usually they are inexpensive household items. Following the activity, there is always a list of extras, including an assessment – usually 3-5 questions that check for understanding. We’re currently working through the “Spaceship Earth” unit of 5th grade science. It’s all about astronomy – the sun, stars, constellations, seasons, etc. For a quick activity in between mysteries, the kids made these cute constellation maps to hang on the wall. We put a list of constellations on the board and each student chose one to work with. I put my sample up on the board then turned them loose with half a sheet of black card stock, some gold star stickers, a white colored pencil, and a ruler. They looked up their constellations on their computers, drew out the shape of it with their ruler and white pencil, then stuck the star stickers on. The constellation names were written on the front with the white pencil. A simple, fun activity for any kid old enough to handle a ruler! Does anybody else use Mystery Science? What kinds of activities do you use to go along with it? Back to school time is quickly approaching, and I’ve been searching Pinterest for some fun things to do during the first week of school. The first few days are always a little weird until we get into the routine of a regular schedule. These are some of my favorite activities that I’ve found so far and plan to try when school starts. Some we used last year and will be doing again, some are new ones to try. 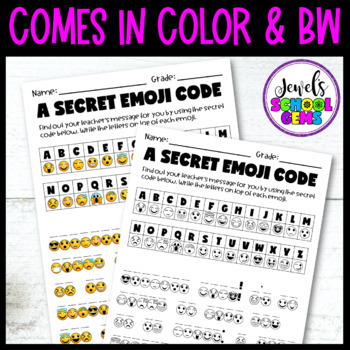 Back to School Emoji Activity – Last year’s class really enjoyed these decoding sheets, and of course emoji-themed things are always a big hit! This would make a nice, quick activity for getting settled first thing in the morning. Back to School Class Puzzle Mural – I have been wanting to try a class puzzle, and the first week of school would be a great time to do it. The kids would really have time to get creative and it gets some art work on the wall right away. 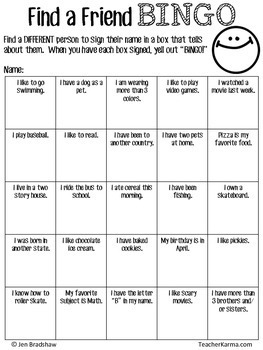 Find a Friend Bingo – Back to School Ice Breaker – I love these! We did something similar last year and every single person participated and interacted with students they had never met. Who’s in Your Circles – Getting to Know You Game – We actually used this one a couple of times throughout the year last year, and the kids really enjoyed it. Those who don’t spell so well yet just drew a picture in the center. A bonus is it gets everybody out of their seats and moving around for a couple of minutes. 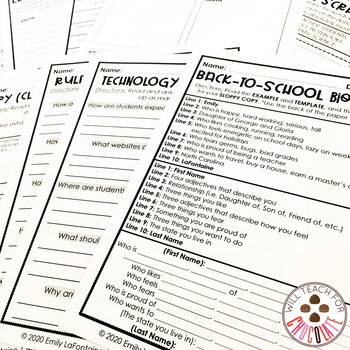 Morning Work for the First Weeks of School – Interest Inventory – I used something like this last year, and it’s a great way to learn some helpful things about each kid right away. They could even share some of their answers with the class and find people who have things in common. Pipe Cleaner Challenge – I love this idea, and I think a lot of our kids who love to build would really come up with some cool stuff. This would probably be fun to do at any time during the year, and maybe switch out the materials each time and see what happens! 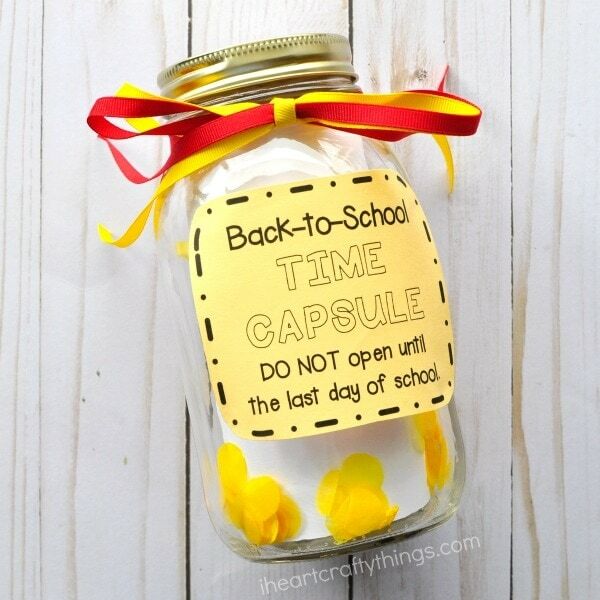 Back to School Time Capsule – I actually tried to do something like this last year, but I could not remember where I put the papers by the end of the year! Putting them in a cute jar and setting it somewhere obvious seems like a much better plan.